The Duck House is a brand new political play written by Mock the Week producer Dan Patterson and Have I got News For Your writer, Colin Swash. The production will make it’s West End debut at the Vaudeville Theatre following a UK tour, starting in October. 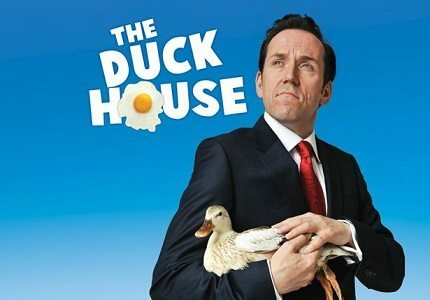 The Duck house is a satire of the events surrounding the 2009 Parliamentary Scandal that revealed the extent to which MPs were claiming expenses for their own personal gain during Gordon Brown’s reign as Prime Minister. One of the most ridiculous expenses claim was from the now former Tory MP, Sir Peter Viggers, who requested £1,645 reimbursement for a duck house, or “floating duck island” built in the garden in his Hampshire home. The duck island soon became a symbol of the ridiculousness of the expenses scandal, this being the inspiration behind the title of the show. The play itself is set amid the very same scandal, although focuses on the fictional character of Robert Houston, a Labour MP who loves being an MP, regardless of the party he represents! As his seat comes under threat, Houston switches from Red to Blue, discarding his old party. However all is not rosey for the new blue as the expenses scandal breaks. Holed up in his lovely country come, Robert Houston, his wife Felicity, son Seb, Seb’s girlfriend Holly and heir Russian speaking housekeeper Ludmilla all find themselves in hot water. Can the MPs career survive the trouble he has got himself and his family into? Casting includes Ben Miller as Robert Houston, Nancy Carroll as his wife Felicity, Simon Shepherd as Sir Norman Cavandish and James Musgrave as his son Seb. Debbie Chazen takes the role of Ludmilla whilst 2008 X Factor runner up, Diana Vickers, continues her acting foray as Seb’s girlfriend, Holly. The Duck House is a political satire about real life events, which may prove relatively uninteresting for young children. Children over the age of 8 who are accompanied by an adult may see the show.